This article provides information on how to configure User Templates. 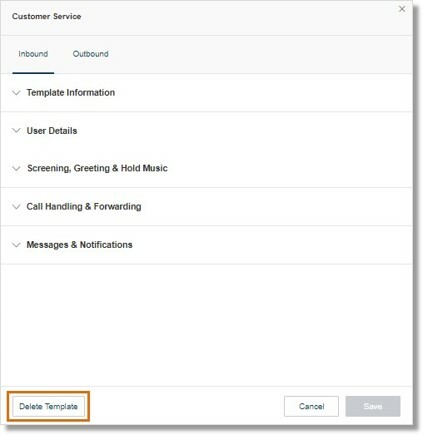 Templates allow Account Administrators to implement a set of configuration to multiple users at once through the AT&T Office@Hand account, reducing repetitive actions by applying same settings to a group of users. IMPORTANT: Only Super Admins, User Admins, and Users with User Admin access can customize the Template settings. See User Roles and Permissions | AT&T Office@Hand for more information. The Administrator should Log in to your Office@Hand account and go to the Users > Templates section on the Admin Portal. Click on the Users tab, and then click Templates. Click Add User Settings Template. Enter the name of your Template, and then click Save. You will be redirected to setting up your created Template. go to User Templates – Set a template, for more information. Account Administrators can configure and customize the following Template Settings. Setting up a template is similar to the initial setup and configuration of a user. Template Information Let’s you edit the Template name, and view when it was created and last modified. Regional Settings Set the time zone, time format, and home country for the user/s. Roles Set Roles and Permissions for users or departments in your company. User Hours Set user hours to 24 hours or Specify hours. User Groups A grouping of Users based on their organization hierarchy. A User Group would have a Group Manager, who have access to modify group member’s settings and view their call logs. Emergency Address Provide a physical address for First Responders. Bandwidth Settings Allows you to change the bandwidth usage of a desk phone or for the AT&T Office@Hand Phone for better call quality. You can switch between High and Low. High Bandwidth gives you better sound quality but calls can become choppy when it is not available. Low Bandwidth gives you lower sound quality but ensures no interruptions during your conversation. Receive communications from AT&T Office@Hand. Turn on this option if you want to receive information on product education, training materials, etc. from AT&T Office@Hand. Screening, Greeting & Hold Music Users Greeting Turn on this option when you want the system to answer the call with a recorded welcome message so callers know they’ve reached the right person. This is not a personal voicemail announcement. Connecting Message Set the default message or create a custom message for callers to hear while the call is being connected. Hold Music Turn hold music on or off and choose from 16 musical styles. Call Screening Turn on this option when you want callers to announce their name before continuing to connect the call. This option lets you identify the caller so you can pick up the call immediately. Audio While Connecting Select the music or ringtone callers will hear while connecting. Call Handling & Forwarding Desktop Apps & Smartphones Enable this feature to notify your AT&T Office@Hand Phone and smartphones before forwarding the incoming call to your desk phones. Incoming Call Information Choose which information will be displayed for incoming calls, and on which phones the information will be shown. Set the announcement before connecting Direct calls and Call Queue calls. Messages & Notifications Take Messages Allow or deny users to take voicemail messages. Voicemail Greeting Select the default or create a custom voicemail greeting. Notifications Choose how you want to be notified about voicemail messages, missed calls, fax transmission results and received text messages. Caller ID Choose the phone number to display as your outbound caller ID for each type of outgoing call. Different Caller IDs may be set when making calls using RingOut, RingMe, Call Flip, and Fax. Fax Settings Cover Page Info Lets you customize the information that will be printed out on your fax cover page. Faxes Sent via Email If this option is selected, when you send a fax via email with a subject line the cover page will be used. If you send it without a subject line a cover page will not be used. Click Copy on the template that needs to be duplicated. Enter the name for the new template, then click Save. After a template has been created and configured, you can assign it to a group of users right away. Click Apply opposite the template that needs to be duplicated. Select the users that need to be assigned to the selected template, Click Apply. Method 1: Select the Templates to be deleted from the list, then click the Delete button. Method 2: To delete a template from the Templates list, click Delete opposite the one that needs to be deleted. Method 3: While editing the Template settings, you can click Delete Template at the bottom left of the page.